Customize your theme | Making a Website with Thinkspace! The Theme Customizer is designed to make it easier for you to customize your theme and see the results in real time. To use the Theme Customizer, rollover the ‘Appearance’ button in the menu on the left of your dashboard and the select ‘Customize’. 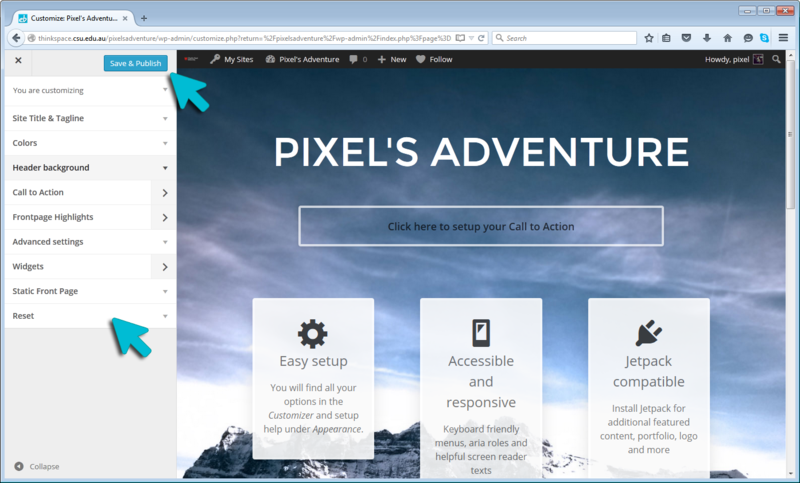 In the Customize window, use the tools on the left to select and preview changes to your site settings. When you are satisfied with your changes click the ‘Save and Publish’ button. Used to change the site title and tagline on your blog. Not all themes display taglines. The site title and tagline are normally displayed in or near the header area of your blog and the site title is also used when visitors bookmark your blog in their web browser. ‘Colors’ controls the color of the header text and background color. Which options are included depends on the theme. Some themes include Custom Header Image settings which can be used to provide a more customized look and feel adding your “own personal touch” to your blog. Upload a custom header by selecting a file saved on your hard drive and uploading it. Some CSU Thinkspace themes include a range of default header images. In this case, the Header Image allows you to choose from one of the default header images. Alternatively, click on Remove image is you don’t want to use a header image. Many themes allow you to upload an image to your blog’s background. A background image is another great way of adding that personal touch to your blog. Please note: The background image is used as is. For best results resize your background to 72dpi and 2000px wide. This will ensure it loads quickly and displays well. Some themes include additional options in the Theme Customizer. For example – layout, slideshow and Typography. Experiment with settings in the Theme Customizer to discover the best fit for your needs. ©2015 CSU Thinkspace. Developed by the School of Information Studies, Charles Sturt University.